This weekend Diane and I stayed home and took it easy, but we did take some time on Sunday afternoon to visit the west side of the Colorado National Monument for a couple of hours during a snowstorm. We drove a snow-packed Rim Rock Drive to its closure gate at the Independence Monument Viewpoint and stopped to take a few photos along the way. We only saw a handful of other vehicles up there braving the winter road conditions. 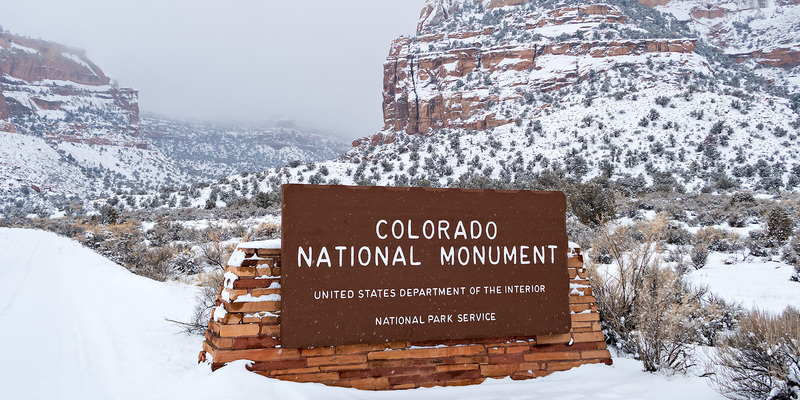 I was hoping to hike a few of the shorter trails along the rim of Wedding Canyon near the Visitor Center in the snow, but once we got up into the Monument we found that the clouds were low and there was no view into the canyons. I didn’t want to hike those trails with no views, so we decided to skip them and only hiked the Alcove Nature Trail this time. I think the last time I hiked this short trail was almost ten years ago, so it was nice to finally revisit it. 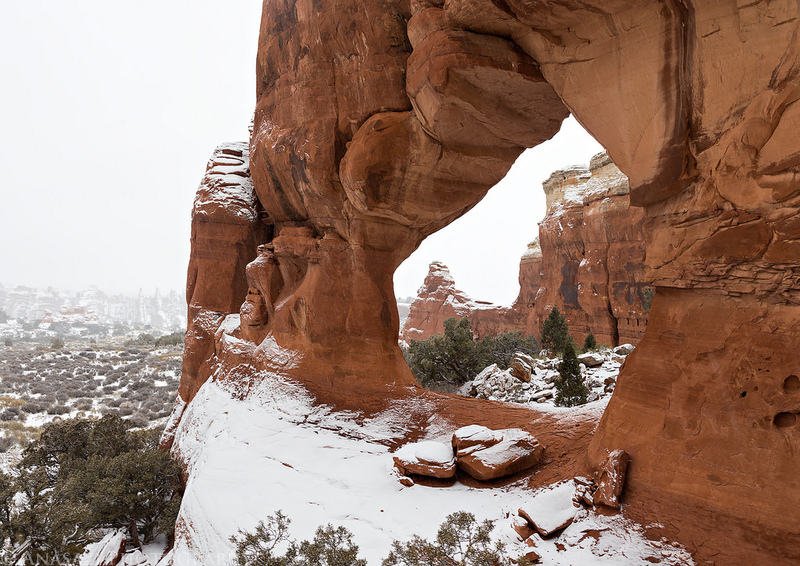 Since it’s become our annual tradition, Diane and I would again spend Christmas Day hiking in Arches National Park. (Previous trip reports from 2015 and 2014.) 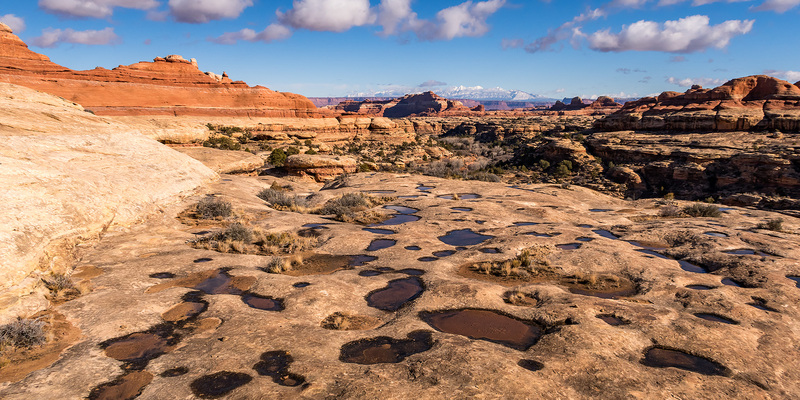 Overnight it had rained pretty hard in Moab and the forecast was also calling for snow. When we left the hotel before sunrise there was still no snow and the ground. However, as we drove into the park it did start to snow pretty hard and would continue to do so until we reached Landscape Arch in Devil’s Garden. It was very windy and cold out during this hike, and even though the sun would come out later in the morning and the temperature would rise a little, the wind kept blowing making it feel much colder out than it really was. The early morning drive from Grand Junction to Arches National Park on Christmas morning was a bit slow since it had started to snow overnight and would continue to do so throughout the day. 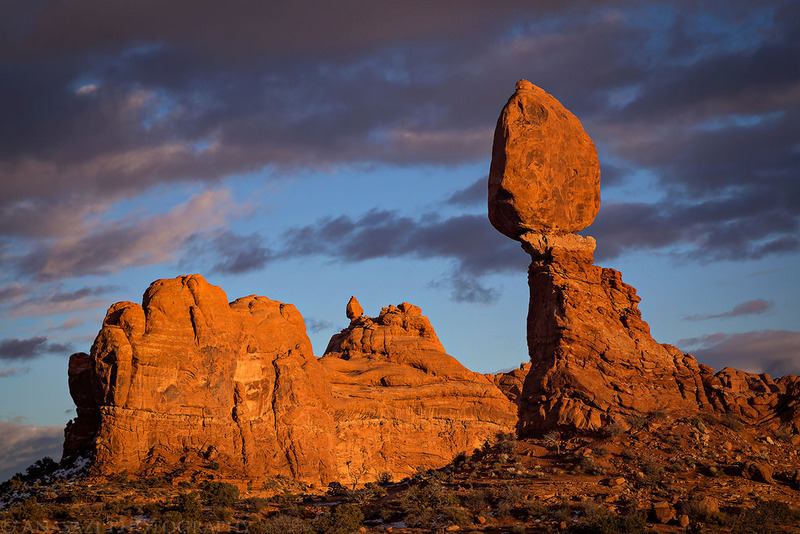 I wasn’t feeling 100% after coming down with a cold earlier in the week, so we decided to head straight to the Devil’s Garden for our annual Christmas hike to Landscape Arch to make sure that it is still standing after another year. I’ve hiked this trail in the winter for the past 8 years but this time it was the slipperiest I have ever seen it! After slipping and falling twice on the sheet of ice that was hidden beneath the fresh powder we put on our microspikes which made the rest of the hike much easier. After our visit to Landscape Arch we decided to visit Crystal Arch nearby which neither of us had been to before. It was nice to get off the main trail and have this arch all to ourselves. While we were visiting Crystal Arch started to snow pretty hard creating whiteout conditions for our hike back to the trailhead. 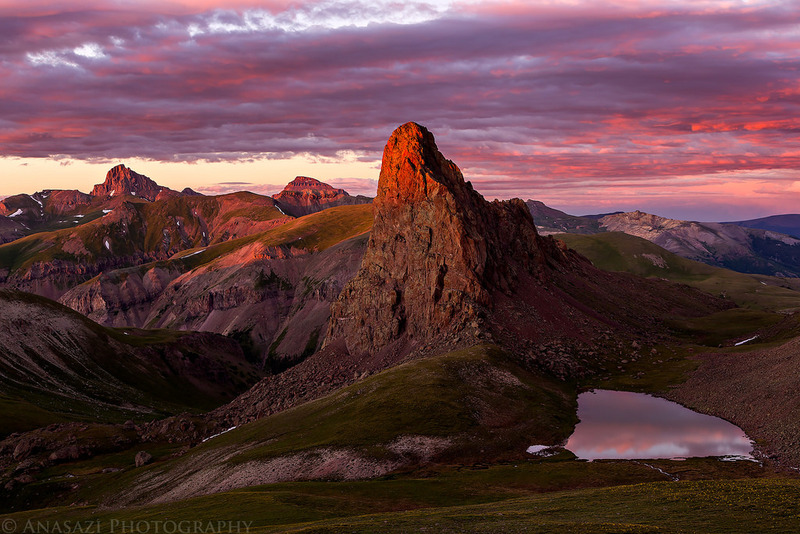 This weekend Diane and I went on an overnight backpacking trip into the Uncompahgre Wilderness of the San Juan Mountains to explore and photograph the area around Unnamed Peak 12968, which is unofficially known as the Dragon’s Back. 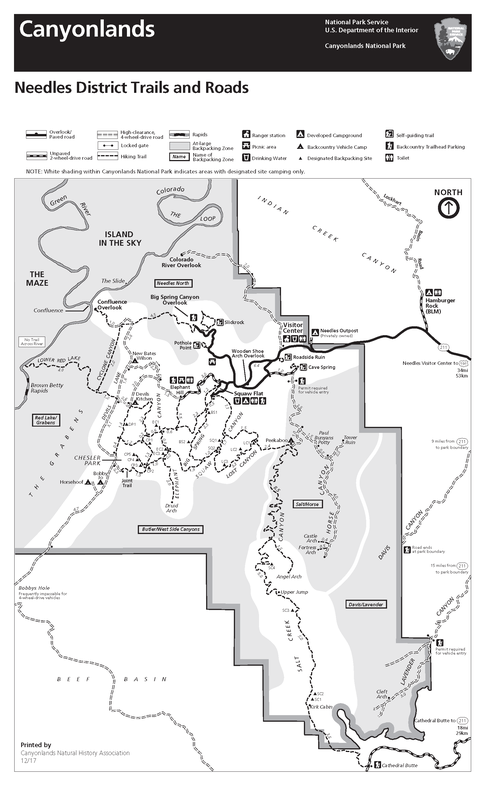 I have wanted to visit this area for a few years and had planned to finally get there sometime this summer, so I’ve been waiting for the right weather forecast on a weekend when I was also free. With the wet and stormy weather we’ve been having around here lately, this proved to be a challenge. Finally, we had some drier air move into the area and this weekend looked like it would be mostly storm free and might still have good conditions for photography. It turned out to be a great weekend for this trip and I couldn’t have asked for a better sunset on Saturday evening!